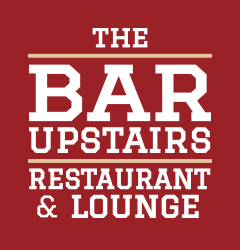 The Bar Upstairs Restaurant & Lounge is a renovated chalet-style pub with a warm and inviting atmosphere. We welcome family and friends around the region and beyond to stop in and enjoy a fantastic meal prepared in house by Chef Jason Gullett. Whether it's an 8oz burger and fresh cut fries, a gourmet appetizer bar for you and 25 guests or a prime rib and pasta buffet for over 100 guests, Chef Jason has a passion for food and a desire to please the palates of everyone. Jason and our trained staff are dedicated to serving only the best from our kitchen every day. Whether you're stopping in for dinner or you choose us for your next catered event, we promise you and your guests will receive nothing but the best when it comes to our food, our prices and our service. The Bar Upstairs lounge is the perfect spot to meet your friends for week night food and drink specials, enjoy our outdoor patio and viewing areas, play pool or sit back and watch the game projected in high definition on our 110" screen! Crispy bacon, lettuce, tomato, Chiptole mayo, you know the rest! All burgers are served with fresh cut fries or salad.